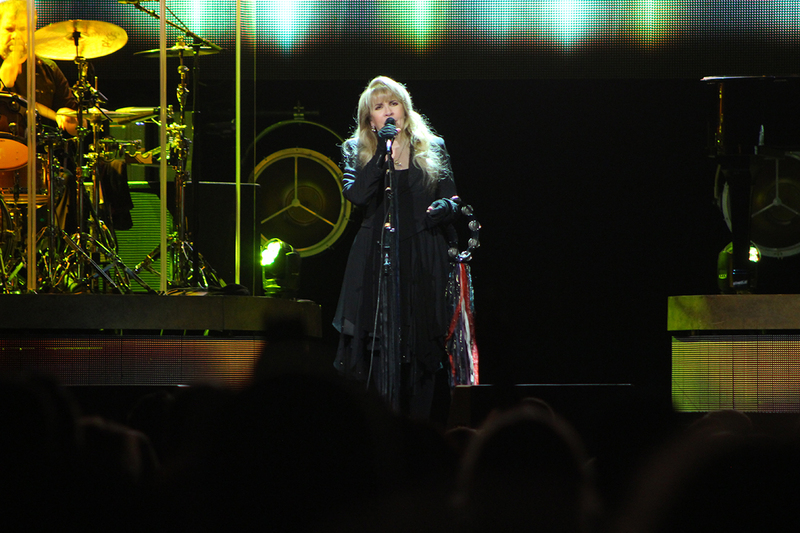 About 20 minutes into her two hour-plus set last night in the Nationwide Arena, Stevie Nicks finally delivered one of her trademark spins. Remaining in place, she went once around, slowly. The packed house, especially the vocal diehard fans, went wild. It seemed a long wait for those outside the cult of Stevie Nicks to get a little something that related to the gypsy-like, often self-obsessed Fleetwood Mac singer of lore. The current tour is not a review of her hits, with Mac and on her own, but a book and music tour without the publication of a book. Some of the material came from her newest release, 2014's "24 Karat Gold: Songs From The Vault," a collection of unreleased compositions dating back to 1969. It dovetails, with the recent extended reissues of her first two solo albums, 1981's "Bella Donna" and 1983's "The Wild Heart." Nicks has taken the opportunity to focus on a selection of her material deeper than just the hits and, more importantly, to tell the stories behind most of them. It was, perhaps, too much information. While for a time at the beginning, the finely detailed chronology of songs such as "Stop Draggin' My Heart Around" were interesting—who knew that she was such an admirer of Tom Petty that she sought out their producer, Jimmy Iovine for her first solo album, "Bella Donna." Or that "Stop Draggin'" was borrowed from Petty after Iovine didn't hear a hit on that collection? That one and the Prince story that explained the inspiration for the 1983 dance hit "Stand Back," were keepers. Turns out Nicks heard "Little Red Corvette" on the radio, composed "Stand Back" based on it and eventually enlisted Prince's help finishing it. Many of the other stories became tedious as the set wore on, at least to most, other than the fanatics. Though a few songs such as "Gypsy," the newly recorded vintage composition "Starshine" and the raving dance number "Stand Back" not only fed the legend but provided memorable performances, it wasn't until "Gold Dust Woman," late in the show, that the Stevie Nicks we've come to expect came around. Building the mystery from the start, the singer ended fairly convulsing, as if possessed by the characters in the song. 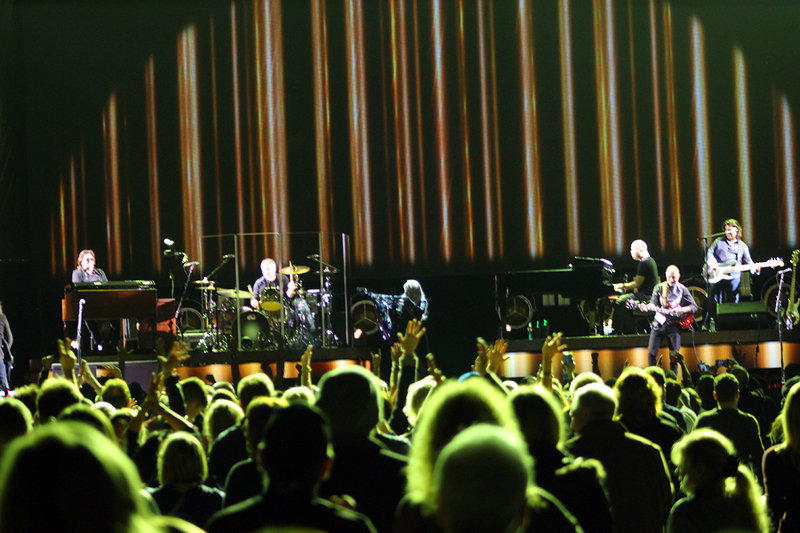 The contrast between the storytelling and the Pretenders, who opened the evening, couldn't have been greater. Chrissie Hynde and her newest incarnation—which, after 37 years still includes founding drummer Martin Chambers—delivered a vibrant hour-long set that felt as comfortable as an old pair of shoes but didn't rely on nostalgia for its appeal. Old faves including "Back On The Chain Gang," "Stop Your Sobbing," "Brass In Pocket," and the smoldering reggae-based "Private Life" proved that, at 65 Hynde can still deliver the goods with no-nonsense and fevered rock-and-roll. Last edited by SisterNightroad : 03-22-2017 at 05:58 AM. Stevie Nicks is exactly what I wanted her to be, but I know she doesn’t care what anyone wants her to be. When the 68-year-old rock star took the stage at Nationwide Arena on Friday night, clad in a black lace dress and crazy-tall boots with a tambourine in hand, I knew it was going to be a night to remember. As she told the crowd, this show was for her. She went through her catalog of songs and picked some of her favorites as well as some that hadn’t seen the light of the stage, for a show unlike the thousands shes done during her more than 40 year career. Unsurprisingly, as a 21-year-old, I was much younger than most of the audience. Like, I’m sure, many of the young people there, I discovered Stevie Nicks through my grandfather. After he died, my dad and I were putting together a playlist for the reception, and he had me buy Fleetwood Mac’s “Rumors” album since it was my grandfather’s favorite. I never knew this before he died, but I’ve tried to make up for it by listening to the tracks and trying to see what he saw in them. 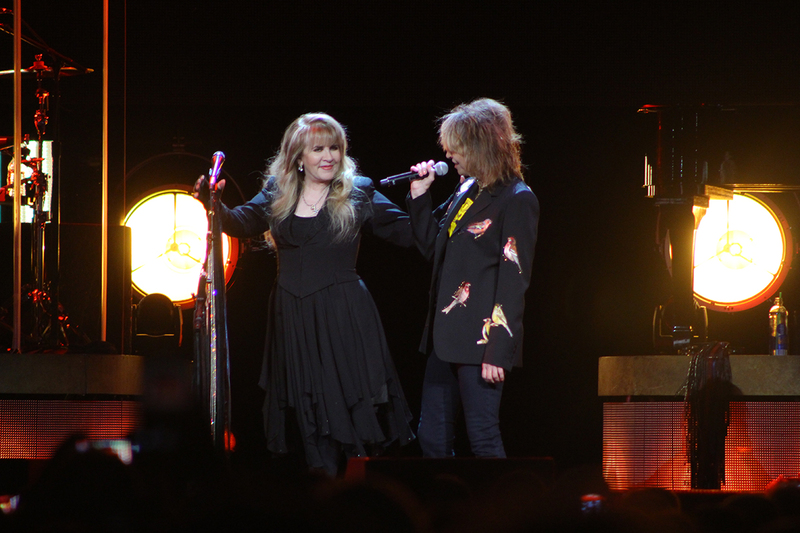 The best part of a concert is when an artist speaks directly to the audience, and does more than just awkwardly asking “How are you feeling tonight?” Nicks delivered with an anecdote for every single song throughout the night, plus some stories about her bandmates and clothing items she wore on stage —including the original Bella Donna cape! The concert lasted two hours and 15 minutes and by the end the crowd was chanting for her to just sing, but I live for personal anecdotes. The stories she told of working with Prince seemed to get the most response from the audience. She said she actually wrote my personal favorite of the night, “Stand Back” while listening to Prince’s “Little Red Corvette” in a limousine. She called him and he came over to approve his influence on the song and help her lay down the track before speeding off in a purple Camaro. A surprising anecdote went along with “Moonlight (A Vampire’s Dream).” She said she was disheartened that people do not buy as much music in the age of the internet, so she didn’t want to make new music anymore. But the “Twilight” saga, of all things, pulled her out of a hiatus in 2011 as she wrote a song inspired by the movie and Bella and Edward’s love affair. 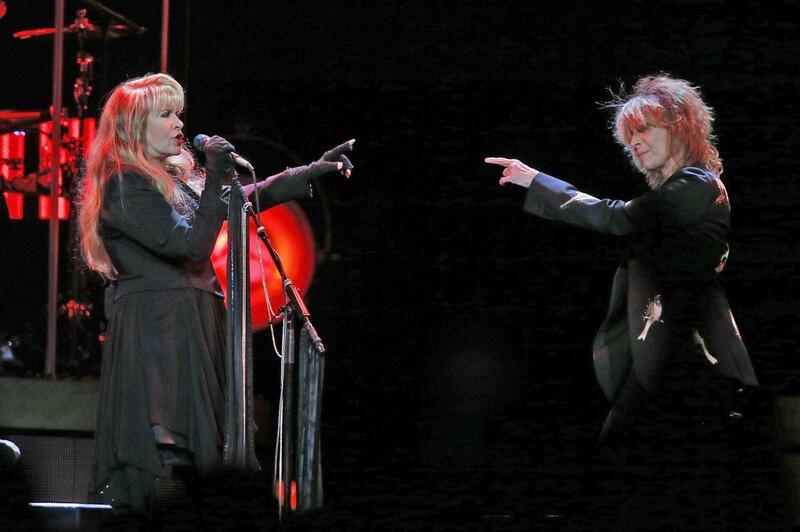 I just love that Stevie Nicks loves “Twilight.” Amazing. Nicks also did a bit of motivational speaking, as many artists tend to do when they take the stage. She told audience members that, regardless of their ages, they should follow their dreams. A personally inspiring story was when she talked about wearing her one expensive outfit and strutting across campus when she was enrolled at San Jose State University in California, causing people to move out of the way. She that through her “vibe,” she convinced people by her “vibe” she was important, and she convinced herself that she was going to be a big rock star one day. Nicks faked it until she made it, and she definitely made it.